A postcard written by Private James Booley in August 1915 from the Dardanelles was sent to reassure his sister back home that he was okay, but instead it ended up being this Gallipoli soldier’s final farewell. 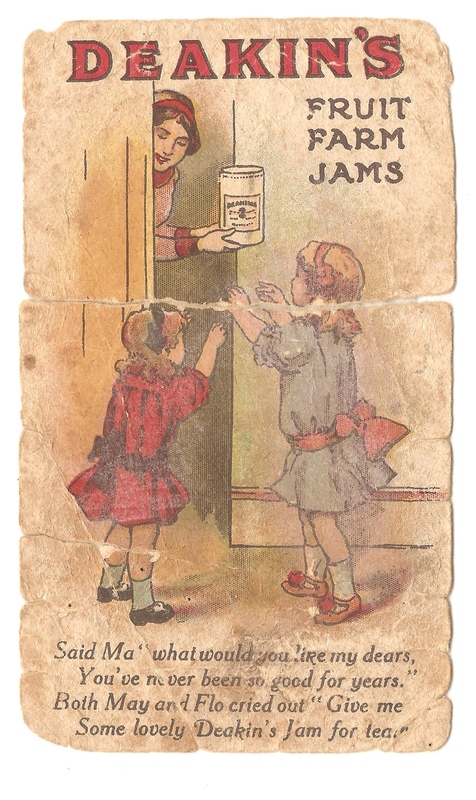 The quaint little ‘Deakin English Canned Fruits’ postcard contains no details of battle because James’ little sister Jean was just seven years old. Addressed to ‘Miss Jean Booley’ of Nyang, via Ouyen in Victoria the 13 mm x 8 mm postcard was dated the 8th August, and had inched its way through Australia’s army mail system and finally stamped for release nearly four weeks later. 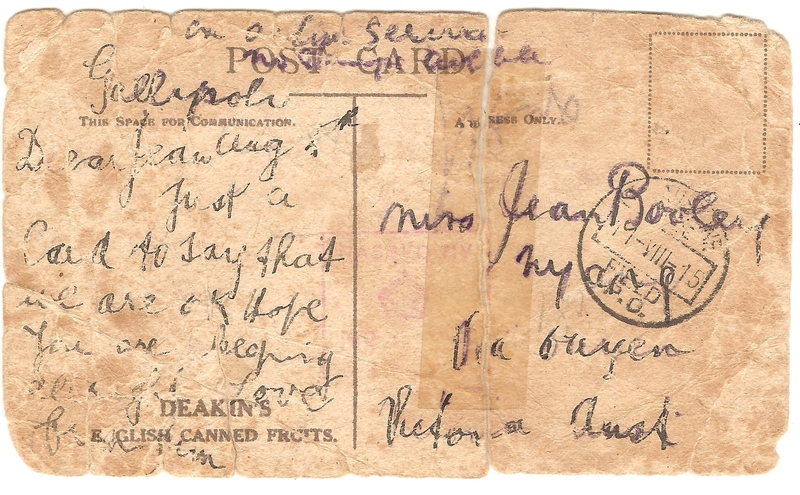 By the time the postcard made it home to Jean her family was already in distress, for word had come that James (Jim to his family and friends)had gone missing in action, on the Gallipoli peninsula. James Booley (1887 – 1915). photo courtesy of David Williams from the family collection of Leigh Williams of Ballarat. Despite pleading letters from Jim’s parents, Walter Scott and Mary Ann Booley seeking information about their missing son, it took an official A.I.F Inquiry on the 28th April the following year at Serapaum to determine Jim had been killed in a military action, on the 8th of August 1915. It might have been a particularly poignant moment when Jim’s card arrived while the family endured an agonising wait to know Jim’s fate. 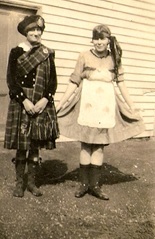 The two little girls depicted on Jim’s postcard might have reminded him of his little sisters back home, for he was the eldest of 12 children with Jean and her little sister Lyn being the youngest. Jim’s card is worn thin by my grandmother Jean’s handling it, and it is one of several postcards sent home from Gallipoli and France during WW1 from her brothers Jim, Stan and Cecil and friend named Bert. My grandmother Jean Williams (Booley) at the launch of sister-in-law Louie Booley’s book on her life as a war bride brought from England to the Mallee district (Vic). Photo from collection of late Peter Williams of Killarney. In 1987 when I asked Nanna Jean about her brother Jim she burst into tears. 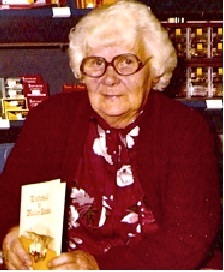 She was the widow Jean Williams of Apollo Bay then, and the mother of eight children of her own and a tribe of grandchildren, but the loss of her eldest brother was as fresh for her at 80 years of age as it was when she was 8 years-old. Nanna Jean’s grief was compounded by guilt that she hadn’t gotten to say goodbye to Jim. With all the talk and anxiety preceding Australia’s war involvement, and with the men going away to ‘join up’ families were jittery about what was to come. It was in this environment that Jim came home to say goodbye before he sailed for Egypt in February 1915. My grandmother said when she heard the clomp of Jim’s boots on the veranda she was frighted and hid under the bed. 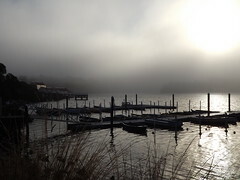 From her safe place she could make out a figure in a great coat and slouch hat, with leggings and great boots. No amount of coaxing would convince Jean this was her brother Jim. 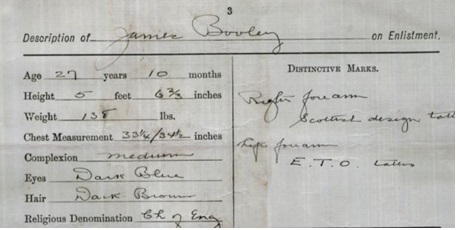 James Booley’s physical description when enlisting for WW1. Source: War Service Record B2455, NAA, 2015. Jim had sailed from Melbourne in the 3rd reinforcements to the 14th battalion A.I.F on the 19th February 1915 aboard HMAT Runic. After arriving in Alexandria in Egypt around the 3rd of April Jim was immediately taken on strength of the 14th Battalion, which left Alexandria on the 11th April bound to the Turkish -controlled Dardanelles. The 14th battalion along with the 13th, 15th and 16th formed Australia’s 4th Brigade at Egypt under the commanded of Sir Colonel John Monash. At Egypt the 4th Brigade was assigned to the Australia and New Zealand Army Corp (ANZAC), one of two Australian divisions who along with two British and two French divisions formed the British Allied ‘Mediterranean Expedition Force’ (M.E.F), the Allied force of the Dardenelles campaign. To gain control of the Dardenelles it was imperative the M.E.F secure the “Narrows’, the Turkish Dardanelles Straits that linked the Mediterranean Sea with the Sea of Marmora. Control of the Straits would give access to the Turkish capital Constantinople and much of the Turkish Empire’s industrial powerhouse as well as provide a lane to the Black Sea. “As might be expected given the huge tactical and strategic value placed upon the Straits, they were however heavily defended, chiefly by natural geography. To the north they were protected by the Gallipoli Peninsula; to the south by the shore of Ottoman Asia. In addition, fortresses were well positioned on cliff-tops overlooking shipping lanes.” . Failed naval attempts in February and March 1915 to take control of the straits, made it clear that ground support was required and so a month’s pause in operations was undertaken pending preparations for Allied landings at Helles and Anzac Cove. The April 25 landings “were largely mismanaged’ but two beachheads were established: at Helles on Gallipoli’s southernmost tip and another at Gaba Tepe, futher up the coast and which was later renamed Anzac Cove to honour the ANZAC corps who ‘bore the brunt’ of operations there (source). (Corporal George Witham Orpwood of Nagambie, Vic. #763 14th Battalion in Nagambie Times 6 Aug.1915, TROVE, NLA). During this time British First Sea Lord Admiral Fisher’s resigned dramatically on the 15 May 1915 over Churchill’s handling of the Gallipoli campaign, which led to Churchill’s own resignation. Sir Ian Hamilton, the M.E.F commander-in-chief realized ‘neither the northern nor the southern forces were strong enough to fight their way to the Narrows’ and ‘cabled on May 10, asking for two fresh divisions in order to prevent the attack degenerating into trench warfare’. He further warned on May 17th that if the M.E.F was left to face the Turkish army on its own resources, two additional army corps must be sent, especially as several extra Turkish divisions had arrived at the Dardenelles. The newly formed Dardanelles Committee in London met on 7th of June and agreed to send Hamilton an additional three divisions, but the Turkish were also reinforcing their defences, and all the while Australian soldiers were fighting for their lives in trenches and gullies, while politicians and war councils played politics. 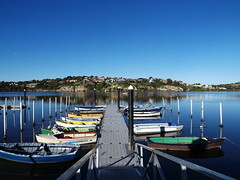 By the end of July alone,3 months from the time of the landings some 4,000 Australian soldiers had been killed alongside French, British and India casualties and thousands more were wounded, but that didn’t stop plans for one last push by the Allies to capture the Dardanelles, with a planned attack in August as the promised divisions arrived. Back in Australia soldier’s letters home and news reports were studied anxiously for information of loved ones. Jim’s mother Mary Jane Booley was one of thousands of mothers who waited anxiously for news of their sons at the front. Photo courtesy of David Williams, from the collection of Jim’s nephew Leigh Williams, Ballarat. The August plan to finally secure the Dardanelles meant the ANZAC force needed to capture three significant high points on the Gallipoli peninsula – Hill 971, Chunuk Bair and Baby 700 ( Kevin Fewster in ‘Frontline Gallipoli’, Allen & Unwin 1983) and it was near Hill 971 that Jim Booley lost his life. Three months of continual Allied hammering at Cape Helles had failed to produce any worthwhile gains Fewster wrote, so it was decided to launch ‘one more offensive’, this time at Anzac Cove and with the date set for August 6th. With 25,000 fresh reinforcements to hand the British launched a feint from Cape Helles at 2.30pm on August 6th. A second feint was made at 5.30 am by Australians against the strong Turkish trenches on Lone Pine. But the real attack commenced after dark in a three-pronged operation: Turkish outposts were to be cleared around the foothills of Chunuk Bair by the New Zealand Mounted Rifles, while the ANZAC brigade advanced up the rugged Rhododendron Ridge to attack Chunuk Bair. And on the left, the 4th Australian Brigade, led by Brig –General John Monash was to advance through inhospitable terrain, to attack Hill 971. With the 4th Brigade went its 14th Battalion and reinforcements including Jim Booley. The 14th Battalion’s official war diary (pps.64 – 70) Australia’s War Memorial website shows orders were given (7th Aug) that the 4th Brigade was to make an attack on Abdul Rahman Bair spurthe following day and the 14th Battalion was to ordered to ‘fall out’ at 3.am in readiness..
On the 8th August the 14th Battalion moved out in single file in rear-guard of the 15th battalion, and crossed and then deployed into lines of platoons in a field on a ridge north of Kaiajik Dere. Major Dare took command of the battalion after Major R Rankine ‘feinted’ , the 14th’s diary states, and an advance was then made ‘under heavy rifle and machine gun fire’ and casualties were heavy. Then the Order was received that the entire Brigade was to retire, collecting all ‘gettable’ arms and equipment and wounded me. The 14th battalion retired by platoons back down the Kaiajik Dere and by 10p.m the 14th battalion had retired to Australia Gully but Jim Booley was not among them. 36 men were killed this day according to the 14th’s war diary, including 3 officers: Lieut H.Harris, Lieut J.H. Mathews and 2nd Lieut. T.W.Hill. A further 93 men were wounded including Captain H.N.Boyle, 2nd-Lieut. K. Curlewis and 2nd-Lieut. L.J.Moorehouse whilst 128 were missing (including Lieut R. Warren and 2nd-Lieut L.H.Luscombe). “It is now four months since we landed on the Gallipoli Peninsula and four months of hard times and hard fighting. .. Our Battalion, the 14th, and also the other Battalions of the 4th brigade have been in some severe fighting and also in three charges. They cost a lot of men, but costs the Turks a great many more. Our artillery and war boats bombarded their trenches on each occasion, and played havoc with the Turks, inflicting heavy losses on them. You can’t imagine what it is like about with 50 or 60 big guns and the war boats firing at the same time. It is deafening with the shells screaming through the air… I tell you what we have gone through this last three weeks has been no joke.”(Colac Herald (Vic: 1875-1918),18 Oct.1915,p7, TROVE ibid. Bean in his diary (Fewster 1983,p.147) wrote he believed Monash didn’t get to Abdel Rahman ridge because he waited too long till his left (flank) was in touch with the British. “We have given the Turks the biggest shock they have had since our landing. We left our rest in a gully, every man on the alert and anxious to again get to close quarter with the enemy. The march out was silent, each man strictly observant, whilst our searchlights played on the neighbouring hills. The swish of bullets round us helped to increase the excitement. We evidently took the Turks by surprise as we were able to gain our required positions with little loss to us. We had proceeded to dig ourselves in and had to do so before daybreak. On Saturday we lay in our small trenches digging as best we could with bullets whistling overhead. It was here we lost our gallant O.C who was shot by a sniper. At two in the morning we got orders to prepare the advance, to carry out more important work. By advancing on to Hill 971 at 3.30a.m we got the order to prepare to charge, and off we started. We were met with a hail of bullets before the machine guns, catching us on the flank and inflicting severe damage, officers and men falling side by side. But on we went, right up to where the Turks were….we hung on till orders were given to retire…” (Colac Herald, ibid). At the 1916 Serapaum inquiry into Jim’s death, Private W. J. Taylor said he and Jim had charged together for Hill 971 on Sunday the 8th of August, but parted ways when the word came to retire. The country they operated in was ‘very scrubby and hill’ which another witness said was ‘Australia’s Gully, towards Suvla Bay’. Taylor said he heard Jim had been hit, and searched for him in the dressing stations without success. The battalion chaplain also searched Jim, who Private Bond saw making for Hill 971 at 3.am as day was breaking. Though he saw Jim go into attack they were pushed back and Jim did not turn up afterwards. 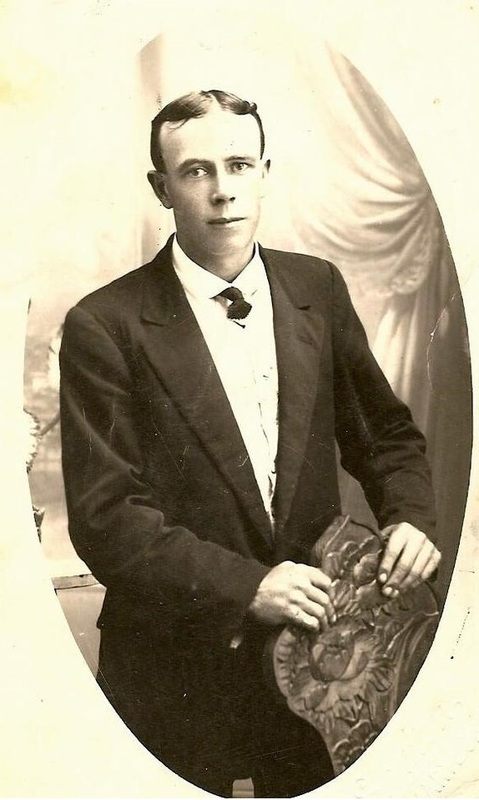 Jim Booley might have guessed what fate lay in wait, and perhaps was sleepless when he picked up his pen sometime between midnight and 3am on August 8th 1915 to pen a few words on a postcard to his little sister. After his death Jim’s cousin Fred Janes took Jim’s dogtags from his fallen body, but as he was also killed Jim’s remains were never formally identified, and he remains one of those ‘unknown soldiers’ in eternal slumber on the former battlefields of Gallipoli. As Jean Williams (nee Booley)’s century –old, worn postcard bears testimony, soldier brothers may have been lost to the field of war but they were never forgotten.